The general risk level facing the construction industry globally has edged upwards, according to the Q3 2017 update of Timetric’s Construction Risk Index (CRI). 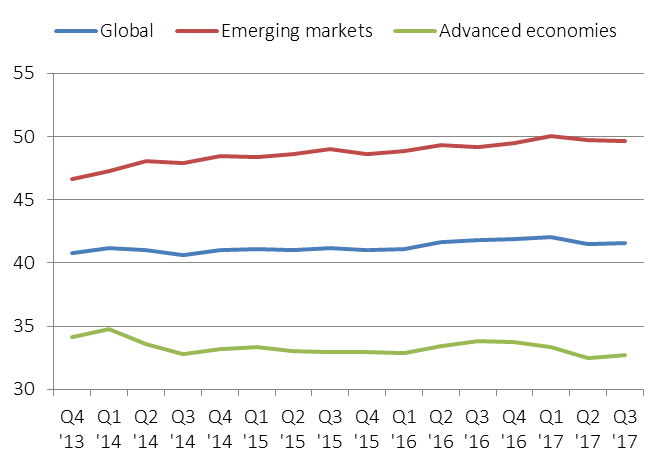 This reflects a worsening risk profile across the advanced economies in the CRI, offsetting a slight improvement in emerging markets. For the advanced economies in the CRI, the unweighted risk score rose from 32.49 to 32.74, while for emerging markets it dropped to 49.70 from 49.62. Sweden and Switzerland remain the only two A1-rated countries in the CRI. Sweden’s economy remains strong, and the construction industry continues to grow at a fast pace. There have been some minor shifts in places for countries in the top 10, within which Denmark and the US have been the best performers. At the bottom of the rankings, Brazil has moved out of the lowest-ranked 10 countries, with the country emerging from the steep economic downturn in 2016. However, political risk remains high, as the president, Michel Temer, deals with renewed allegations of corruption. There were 21 countries that recorded improvements in their risk profiles in the latest CRI update. Many countries in Europe have continued to record positive growth in their construction industries, supported by stronger economies and fixed investment growth. Poland and Hungary have both made significant gains in the Q3 2017 update, which has reflected the marked rebound in construction activity following renewed flows of EU funding. In total, 23 countries recorded a deterioration in their risk profile in the Q3 2017 update. Italy moved down 2 places; the government in Italy remains weak ahead of a likely election in early 2018, and this is undermining the country’s economic recovery. Timetric’s Construction Risk Index (CRI) is designed to provide a standardized view of the underlying degree of country-level risk facing the construction industries in 50 major developed and emerging markets around the world. The model, which is updated on a quarterly basis, provides an analysis of current conditions and a forward-looking assessment of general and specific risks that could undermine the growth prospects for the construction industries, by preventing new projects from being executed, disrupting existing projects, or ultimately leading to project failures. This information is taken from the Q3 2017 update of the Construction Risk Index. CIC clients can access the report here. For media enquiries, please contact the Timetric press office at press@uk.timetric.com or call +44 (0)20 3096 5769.